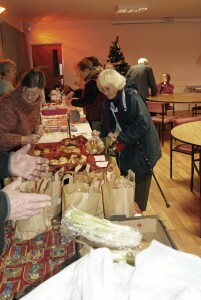 The Community Centre annual Christmas draw on 4th December was a greast success. We were donated 30 prizes to raffle and about £370 was raised to fund our community centre. We were delighted to have Kirsty Williams AM come and draw the winning tickets, and chat to everyone. Several stalls were set up to offer food and trinkets to our visitors.